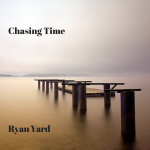 Chasing Time is the brand new classical album by Ryan Yard – perhaps a counterpart to me – composer, performer, transcriber, teacher and Mike Oldfield fan. Released to the public this weekend, Ryan’s work is the cathartic culmination of 16 years of musical composition, refinement and renewal. There is a running theme of water and storms with some apt (and subtle) atmospheric sound effects and lovely artwork. It’s a coherent whole, which follows its musical journey along a turbulent river but with places of reflection and calm. Hints of Nyman, Reich, Einaudi and Oldfield give way to let the composer’s own voice come through and wash over you – ok, enough of the watery references! Performed beautifully and with passion, Ryan’s piano is exquisitely balanced by the Bryden String Quartet, who lead with power when needed and support when required. The tone is clear and present, with superb recording and mixing at Fieldgate Studio in Cardiff by engineer Andrew Lawson. You can visit the album website and order a digital download via Bandcamp (and other online stores soon). It’s a snip at only £7 and you can also by the sheet music score online as a PDF for £5. The download comes with a comprehensive PDF booklet with programme notes and details on the performers and studio. A lilting piano figure in D minor is joined by violin ornamentation and harmonic depth followed by a powerful outburst of 3/4 vs 6/8 before cascading towards the next movement. Originally part of Ryan’s first string quartet, this revised (string only) movement centres around several ground basses in the cello with repeated (and altered) melodic fragments reminiscent of Nyman’s work for Drowning By Numbers. A pleasing and hypnotic experience for the discerning listener. I love this – Intense and angular, this 10/8 ostinato-based movement (again from the first string quartet) is enhanced by contrary motion piano octaves. The development of structure is evident and the almost-relaxed 12/8 viola solo (think Different Trains) is harmonised with some rich minor ninths and major sevenths. Nice texture here! This is followed by a toe-tapping return to 10/8 with independent violin solo, poignant high piano figures and a final outburst before settling to an ominous Dm(add2). A little more melodic cello wouldn’t go amiss – but this is my favourite track so far (2nd listening). Melodic and lyrical, this duet for two violins and piano is understandably popular, with its melancholic harmony and intense build up in the 5/8 piano. Dissonance and consonance are perfect balanced here with a surprise ending with dark harmonies and a beautifully held penultimate chord. Available for preview below on Soundcloud, Embrace is warm, melodic and features a pleasant change to the string writing, which lightens the texture with a little cello pizzicato under the almost-improvised violin solo. This movement could be longer but perhaps it doesn’t need to be overstated. After a little rain, (and what feels like the “end of the first side”), Rain Chaser opens with enigmatic piano musings and an undulating piano figure in G# minor, which is repeated with intense string writing and great figures in the lower strings. The highlight of the track is the Prestissimo piano solo, dark harmonies, angular lines and a dramatic, unresolved, ending. As the title suggests, this movement features a delicate opening, beautiful melodic writing and descending harmonic extensions. The clear piano recording is almost too close here – a little distance would enhance the feel, in my view. However, the Chopinesque middle section is a welcome exploration of transient modulations and a different feel before returning to the opening ideas. From bar 73, the dramatic re-interpretation in F minor is followed by muted upper tones (perhaps this piano’s only weakness if not on purpose) with musical box memories and a return to the main theme. The Chopinesque chordal ending is not in parody but works very well to conclude this movement. Gypsy dances and tarantellas abound with this romp through E minor with some developing themes. A lighter LH piano would perhaps give a bit more bounce but it adds more depth towards the end which should get you dancing. Originally written as a choral tribute to his unborn child, this beautifully dissonant, lyrical and emotional movement uses traditional techniques of cascading motifs, Tristan-like harmonies and an unfolding texture but overall its beauty is forefront for the listener. Another firm favourite. One of two pieces originally written as dance tracks, this return to D minor starts with a solo violin and atmospheric birdsong and a contemporary piano accompaniment. Suspensions decorate the lush harmonies and not over-complicated middle section. Cascading piano figures, pleasing melodies and a good sense of shape and direction make this a firm favourite and easily listen-able. The finale to the main album features a ticking piano opening with lush watercolour harmonies in the strings. A little Oldfield-like decoration in the piano leads to a lyrical middle section and great build up with some staccato cello and LH powerchords – heading towards a final positive resolution. Originally a dance track, this has echoes of Coldplay and The Piano Guys but it holds its own and is a fitting title track in its newer classical form. Kickstarter sponsors of the album received a bonus album of demos (including the originals of the final two tracks in their club/dance forms from early tapes) but it also featured Lamentation, surprisingly (for its musical quality and depth) Ryan’s first composition for full orchestra. Performed by the BBC National Orchestra of Wales, this is an intense exploration of rich melodic writing, intense orchestration, independent string lines (with melodic celli!) and supportive brass and wind lines. Dramatic and powerful with a shimmering second half, the ending is poignant with its melancholy string solos, ominous percussion and dark pedal notes. I look forward to hearing more from Ryan – especially full orchestra if possible. This entry was posted in Reviews by Phil Toms. Bookmark the permalink.